This Circle Island Tour is designed to give visitors a full spectrum experience of all Oahu has to offer. Traversing the island, you’ll ride in style in one of our brand new Safari Jeeps and be entertained throughout the day by your lively guide. Oahu’s diverse landscapes are some of the most breathtaking in the island chain, with endless points of interest to explore. 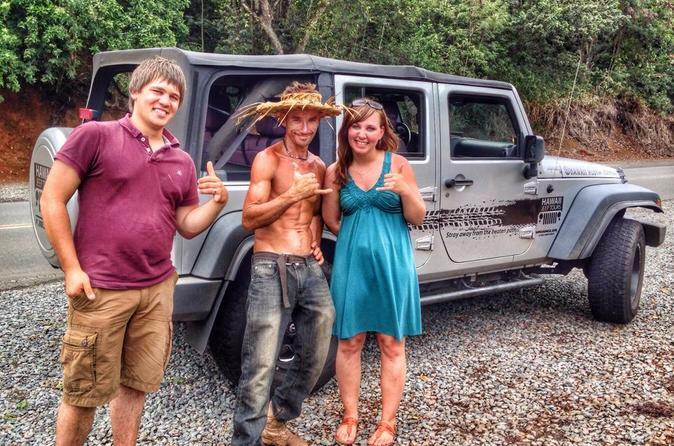 Get ready for a personal experience with a local guide born and raised in Hawaii! You'll work your way along the coastline, landmarks like Diamond Head, the Pali Lookout, Chinaman’s Hat and Laie Point are just a few of the 20 or more locations your guide will explore with you. All ideal landmarks for photo ops, this tour offers plenty of time to do some exploring on your own. We’ll also take you to see famous places like Banzai Pipeline, Sunset Beach and Waimea Bay, where the world-class waves are known to produce quite a show during the winter months. Other places like the Mac Nut Farm, Shark’s Cove and the Aloha General Shave Ice store are a few other things we have in store for you during this tour. Enjoy a no-host lunch at one of the famous Shrimp Trucks of the North Shore and dine on juicy, fresh, Hawaiian shrimp! You’ll also get to check out one of the many cultural Hawaiian Heiau’s (Temples) at your guides discretion, if time permits- and secret spots for ideal turtle and monk seal viewing. We’ve got all the underground, off-the-beaten-path places for you to enjoy a unique day in Hawaii. Winding through the North Shore, we’ll take you to old Haleiwa town, where boutique and gallery shopping is ideal and you can find a late afternoon pick-me-up at the local coffee shop. We’ll end our full day at a special beach at the Haleiwa Harbor as the sun begins to set upon the North Shore giving you more Photo opportunities. Before the Sun sets we’ll head back to your hotel as we take the Jeep through the Dole Pineapple and Coffee Plantation. Nothing beats having a local show you around!